Cheesemaking is still very much a craft in Switzerland. Different kinds of cheeses are mainly done by hand on small alpine dairies. For the multistage production dairymen use incredibly tasty raw milk of alpine cows, and the final product is delicious. However, despite the great popularity and high quality of Swiss cheeses, local farms and dairies are on the edge of desolation. We met Dietmar Benedetti, the Swiss dairyman, one of the last original cheesemakers from Obergoms, Kanton Wallis to find out the reasons and possible ways out for the local Swiss farmers. As for person who always lived in a big city, all these pictures from the places where you live and work, make me believe that it is a real-life fairytale. So, the first thing I would like to talk about is about the life in the village: What people do, what people eat there, where they buy groceries, all sort of things. In the area I live in, most people go and buy food in the grocery stores here, and over the last decade there are less and less people: they are living in the cities because there are not very much work here left anymore. And that is also the reason we are now looking for some alternative ways to find new customers. What kinds of work have already disappeared? Well, the most people are either working in the agriculture, or have some interest in hotels and tourism. There are mostly winter tours because there are more skiing parks, and during the summer, there are people mostly working up and down the mountains. They have also a golf club here. However, tourism is a bit limited here. There are few tourists who just go only to the mountain, but most of them just drive throw the passes. And about the grocery stores, what are kinds of products which are mostly sold there? There are two brands which are widespread in the valley: One is Coop, and the other one is Volg, and that's about it. And both of these chains have the buying departments that buy the stuff and deals with single stores which buy the stuff from them. Are there any local products in these groceries, are they are mostly foreign? They have a little. For instance, Volg have some of our cheese. I don't know about Coop, but I think that they buy not so much around here. Maybe, there are not a lot of local products because of strict regulations. Swiss food regulations are very strict. How do you think, is the quality and origin important for the people there? Is it a part of the culture? I think that the quality is more important for the people who live in the cities, just because they can afford it. In the villages, people often consume the products produced on their own, and they look more for the best price rather than the quality. It more sounds like the people are more trying to survive, aren't they? You know, over the last years it is becoming more and more difficult, not only in Switzerland, but in almost all the European Union and everywhere. The salary hasn't kept up with the inflation, and even though we are said that the inflation is really low, we can go to a store and find out that the inflation is much higher actually. The people always has to see what they have in the pocket and that limits what they can buy. Sounds not very optimistic, to be honest. As I can see, small producers face the pressure from the large food businesses. Yes, and the large food businesses often go for the masses. For the producers, when they have only a few big clients, the big clients are who dictate the price, and that's the big problem, because they tend to push the price down, and the farmers are in hard times for surviving. The large businesses just rip off all the profits, so that when you go to the store, you don't get those groceries for cheap. And this leads farms to give up, isn't it? Yes, this leads a lot of farms to give up. Some have bit of subsidy, so they can still work, and without it they would have to give up. There are not that many people working in agriculture anymore, because there are more and more machines used in agriculture by businesses, and there is less the work for people to do, and they just move away from the countryside. Maybe, the internet might bring back some people, because they don't need to stay in the city to do their work. They have some jobs they can do through laptop. But for now, let's say, over the last years, more and more people were moving away. And once there are an area with people moving away, it's kind of hard to bring the people back because all the services at a certain point decline. They just don't have enough clients. As you can see, there are some areas with the tourism sustaining it, and other areas with small tourism, you can see a big difference then. I think that there is another problem with the farming: it is suited more for the summertime. For instance, what do you do in winter? Well, for our business, cheese production goes all year long. There are only few months which are not as intense, but it's an all-year business. It's not like growing vegetables, where you can't grow the vegetables during the winter time. Do you know some neighboring farmers? How do they plan to find their way out from this situation? Well, some just are so busy that they have to go day-by-day and don't have much time to think about what is going to happen the next year, or even the next five years. I would say, most of them. And it doesn't leave enough time to think about new ways. However, it cannot be said governments don't support the farmers very much. How do you think, will the farms continue to exist without this help? I think that many farmers would have to give up if they don't get any help, especially in the higher regions, where the land is not that productive than that of the lower levels. You have a high food quality, but you don't have the amount, because, you know food production is always sold in liters or kilos, and it doesn't say anything about the quality. It's just about the amount. And you can grow more stuff at the lower elevation than on the higher one, but you don't get the extra price for it. The Alpine farming works only because it has a little bit of subsidy, and that's really important, because if they stop doing this, if they stop bringing the cattle up the Alp, then the whole countryside would change. At a certain level, you know, there are no trees anymore to grow, and if the grass is not cut or if you don't have cattle to eat that grass there, then you will have longer price. When the snows get down, and you will have more avalanches in the winter than if those areas are cultivated. The whole countryside will change completely. There are some areas I know where there it's not feasible anymore to bring the animals up in Alp, you see that they had reforestation. Countryside changes completely. To talk about the future, I would like to know something about your past. May I ask about your history? You're dairyman. Is it your traditional profession that you inherited across generations, or did you come to this by yourself? No, it's not my original profession. I started out in sport. When I was young, I was doing competitive ski racing, then I went into coaching for some time. I also worked in financial sector for some time. At a certain point, after the last crisis that we saw in 2008-2009, I was wondering where we are going to head at, which is going to be the direction, so I went a little bit more into the food sector. I was trying to figure out how this can be sustainable, and that's how I went into dairy business. And what are you doing in particular? And what part of your work do you love the most? Well, I still work in the tourist business in the winter. I'm still working in the skiing industry, and in the summer I decided that I did not want to do this all year long, because when I was coaching, I saw snow during 180-190 days a year, and I don't want to do this anymore, and that's how I got into the dairy business. A friend of mine in Germany has his own dairy, and I helped him out a little bit. I see that many things have to change, because what brought me to this was basically high quality fruit. I see when you go to the stores, the quality is not the main focus. It's the shelf life. Everything that goes on a shelf on a store, needs to be there several days a week, otherwise they wouldn't even consider it. That means that you have to alter the food, you need to put additives and stuff that make it look good, keep it longer on the shelf. I think that's not necessary. So the food quality means a lot, isn't it? Yes, because that's what we're sticking into our mouth and has a big impact on our health. A few days ago, I was looking through a few pictures from 60s and 70s, and I made up my mind that the people since then have changed a lot. AT a certain period of history, the people didn't have a lot to eat, they just had the most essential things, but it wasn't refined. Things were healthier. You didn't see that overweight people. Whereas what I see in Europe now, is something I could observe fifteen or twenty years ago in the US. A lot of people were overweight. That has a lot to do with the quality of food, not just the diet. And how do you think, can you name these changes positive? I see a lot of things that have the potential to be positive. I haven't seen a lot of positive changes over the last two years. I would say, the things were going downhill. What I see, and that's what brought me to FoodCoin is integrating new technology which would help us to get to a healthier lifestyle. Let us talk about FoodCoin. This is a blockchain project for farmers and small producers. Have you heard about blockchain before, or how did you come to this? When I first learned about blockchain, I was in Canada. It was in 2014, I was couching a group of juniors. That was the first time I came in contact with blockchain, bitcoin and all the cryptocurrencies. At that time, it was hard to figure out how those things work, but it then got me interested, and I saw an alternative to the system we have now, and I hope this thing will work out over the next two years. The thing I really like in the idea is that no one is really in control, and we have no fear of being monitored in the system. We actually have a few people in control who can control and decide how much money there is in circulations, how expensive the money is or how cheap the money is, will our savings be worth, or they are going to be worthless. On the other hand, a decentralized system is not as easy. This is all linked together: it got us from the food to the financial system, because, in the end, we as consumers can only decide what we buy from what we see on the shelf. But we cannot decide what goes to the shelf. This is more a matter of finance, because if someone comes up with the idea and says: "Oh, I have this great food, I want to sell it", if no one finances this project, it won't realize, will never come into being, and we will never know about it. Don't you think that getting the industry out of control will not be so good? How much control does the industry need? Well, let's say, if I produce something in my kitchen for myself, I know where to pick the fruit or the ingredients I need. I know what I did, and if I know all this the different steps, I'll have the warranty that I have the high-quality fruit. The problem is, when I must buy stuff, I don't know where it comes from. Talking to Gregory, I figured out that FoodCoin and the blockchain can be a way to have the end consumers to see what exactly happens throughout the whole production chain. Then, the consumer can decide if he wants to buy the stuff or not. What we have right now is rather different. If we go to the store, we can see where the stuff comes from, but we don't know anything about how it's produced. I mean, the authorities always have the access to this information, but the consumer does not have that, and the consumer can't decide based on that knowledge. It's more a decision on believe, and probably also advertisement: better advertisers sell. You mean that controlling the food quality is good, but in the financial sphere, producers need more freedom, is that right? Yes. We don't have "some money". We have money... It's like playing Monopoly, but someone adds money to it all the time, and we don't have anything. We are not asked questions and cannot even define the price anymore, because it's all based on belief. Today people wake up and say: "Hey, what is this stuff worth anyway?" And no one really believes that you can buy something with it tomorrow. Nobody will accept it anymore. Now we just have this what called legal te ... are forced to accept fiat money payment. Because if I don't accept it, someone will go to the court and say: "He didn't take my money," and court will decide and say: "You have to." I think it can help not just in farming, it can help the entire society. As long as we have a choice that we can decide what do we want to use, Swiss franc, euro, dollar, cryptocurrency, in the end, some money will win. The thing that works best will work out. The problem is that we have a monopoly: we cannot decide anything. This is the problem, and therefore producers cannot develop and grow. 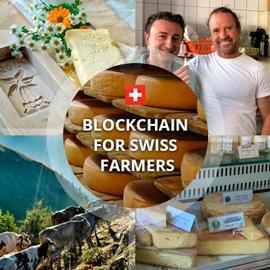 How do you think, why do not all the dairy farmers, for example, or some producers nearby in Switzerland cannot use the cryptocurrencies. Why they don't use them already? One thing is that they don't know enough about it, because it takes some time to figure out how it works. From the concept here, it is so different from what we are using right now, that it takes a little while to get used to it. Another reason is the volatility, because it is still valued in cryptocurrency. That means, if I take for example bitcoin, at the end of last year it was up to $20,000 almost, now it's about $7,000. You have a lot of volatility, it goes up and down calculated in cryptocurrency, and this is a little bit a problem, as long as you have to pay your supplier in the other currencies, so we sometimes have to risk because of the exchange value. The best way would be to add all supply chain to it? Yes, it could be. For instance, if I had a client that pays me with bitcoin or whatever, and I can buy the stuff from him in the same currency, it would not be a problem for me, because I don't have to change from one currency to another. It is the same as if I had, for instance, customers paying in US dollar, and suppliers I have to pay in euro. In this case, I will have problems with the exchange value between euro and dollar. So, the problem is in the popularity of the cryptocurrencies? I think, many farmers are just not ready to use it because they just do their work. Not everyone has a chance to go to Canada and learn about the crypto. Yes, the best way to understand them is by using them, by getting the feet wet, because you cannot learn this by getting theory about how things work. If I don't try it out, I cannot have any feeling about it, I can't understand it. It's still something, I would say, weird. But once you go through the process and try to buy something or sell something through cryptocurrency, you start to understand how it works. And that's also to words, when you say, for instance, bit-COIN, it's not a 'coin', it's a ledger. The whole system is on a decentralized ledger, and you have a key, and that key is an access to a certain value. It's not that coin as we think of it. This messes up also a little bit the possibility to grasp the concept behind it. As I know you are going to open your online shop on 1000ecofarms, an American online market, and lots of people from USA and other countries will be able to find your beautiful cheese there and other dairy, am I right? Yes, but it's basically the cheese, because other milk products are difficult to ship. Mainly we make the products that come from dairy, from the milk. But it's a bit difficult to ship, because milk in two or three days, you have to consume it. You cannot keep it much longer, whereas with the cheese, it can be stored for years if it's put in an appropriate environment. How much employees are working in your dairy farm? At the moment, we are just two working on that. We would need a third person, especially if we try to move in this direction. You know, it's all linked together. If we are able to make the next step and see that we can acquire new customers, then everything else will follow. But somewhere you have to start. However, as for interview, we need to finish up. And you have something to say to other farmers?